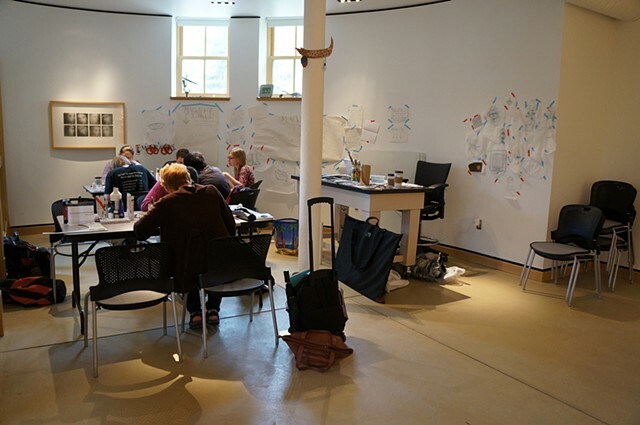 Each Friday during the 2012 spring semester, I held an open studio in the basement gallery of the Christian Peterson Museum at Morrill Hall where the project was on display. Students, faculty, staff, and members of the local community were invited to participate in the project, either by changing the murals magnetically, engaging in a dialogue, giving ideas, or designing and painting their own magnet to add to the project. Each Friday, an average of 30 to 40 people came through the space to participate, making it truly a community-based project. Students from the College of Design came often, communicating that they found the project a stress relief from their courses and assignments. Staff brought their families to create pieces for the project. I was unprepared for how fulfilling these open studios were to me and to those who participated each week. These weekly collaborations created bonds and community naturally over paint, pencils, and cups of coffee on Friday mornings. The gallery became a site of building goodwill, social capital, and creative activity, rather than simply an archive of objects. By the end of the semester, community members had increased the archive of magnets from 100 to about 400.